KwaZulu-Natal boasts a very large and diverse bird population. This is not surprising when one considers the extraordinary range of habitats present in the province. These range from alpine areas in the high Drakensberg, through open grassland and forest in the Midlands, and bushveld in Zululand, the great coastal plain with its climax forests, and finally the wetlands and marine areas in the St. Lucia region. 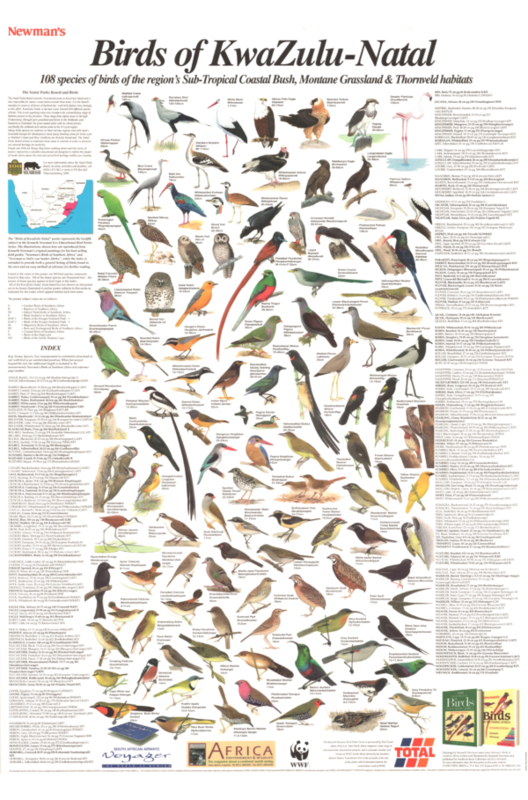 Listed in the index to this poster are 269 bird species commonly found in this area. 108 of these are featured on this poster, illustrated by Kenneth Newman. Among the bird families represented on this poster are: apalis, barbet, batis, bee-eater, bulbul, cisticola, crane, eagle, flycatcher, kingfisher, owl, pigeon, pipit, plover, quail, robin, bush shrike, sunbird, twinspot, vulture, warbler, weaver, widow & woodpecker. The wall poster measures 860 mm x 594 mm (33.9” x 23.4”). The poster is double laminated (ie laminated both sides) for ultimate protection, and will be shipped to you in a sturdy postal tube. Many of our customers throughout the world choose to frame or blockmount the poster such is the quality and impact of the poster itself.